It was 5.30pm on our 5th day. The sun was setting and I was running along a dirt track in my pants. 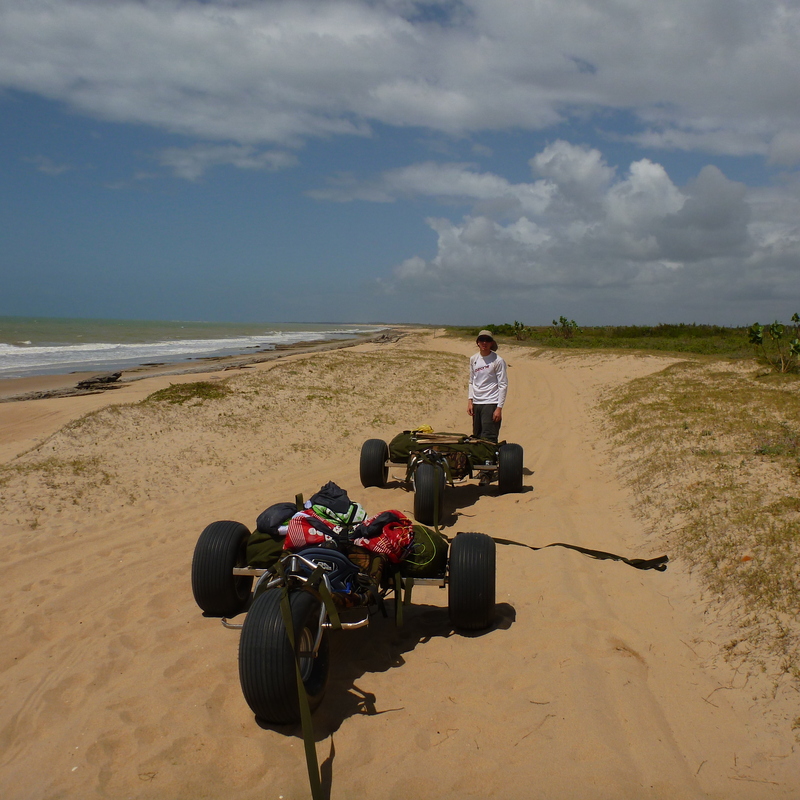 The tide was too high to kite so we had come off the beach continued along a track. It was my turn to tow Charlie in his buggy as he pulled my buggy behind and fended off chasing dogs with a big stick. Hauling a combined 200kg up a hilll was hot work, which is why when we saw the welcome sign for a Pousada (homestay) we must have looked an odd sight. But Edson, eccentric owner of the Urca do Tubarao didn´t seem to mind. He ran out to welcome these strange travellers with their trikes that looked like they had broken down. Charlie showed him the Portuguese translation of our journey – our Portuguese is definitely not good enough to explain it verbally – and Edson immediately said we were welcome to stay at his Pousada free of charge. After another long day of kiting, covering 40km of coastline from Touros, this was very welcome news! Even better was the demonstration of his homemade cachaca production line, from sourcing the sugar cane to bottling the spirit (the basis for the famous Brazilian caiprihina). He then presented us with the bottle, which Charlie gleefully added to his expanding collection of rare spirits. This entry was posted in Journal by Harry Thuillier. Bookmark the permalink.